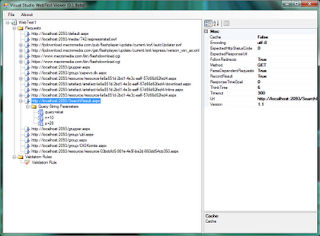 Visual Studio WebTest Viewer is a portable tool which reads VSTS WebTest XML into familiar tree structure. As the name states this tool is just a viewer. It could be used to open WebTests exported from Fiddler without the need of having Visual Studio installed. Due to its small size it can be placed on the USB stick and run from any PC with .NET framework installed.